Chris Hayes. (Photo: Campus Progress)“One of the most morally indefensible features of American life at this point in history is how relentlessly punitive we are to those on the bottom of the social hierarchy, putting more people in prison than any other industrialized democracy, while being unimaginably forgiving to those at the top – the CEO’s and lords of finance whose malfeasance and in some cases corruption caused the crisis.” -Chris Hayes to Truthout. Chris Hayes, at large editor of The Nation and host of “Up With Chris Hayes,” has written a provocative and compelling new book “Twilight of the Elites: America After Meritocracy.” You can obtain a copy directly from Truthout right now by clicking here. 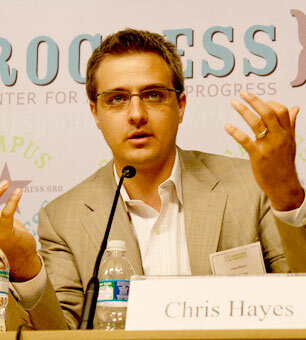 Truthout is pleased to offer this exclusive interview with Chris Hayes about his new book. To those who thought corporate television (albeit progressive) might cause Hayes to pull his punches, this book is refreshingly honest, thoughtful and offers a new paradigm to look at our current social and political landscape. Mark Karlin: Central to your book is the distinction between “the equality of opportunity” and “the equality of outcomes.” Would you explain the distinction? Chris Hayes: Yes. We basically don’t worry very much about equality of outcomes in American politics. That is to say, we accept there will be extremely rich people and poor people and lots of levels of income in between. We have more or less the highest levels of inequality among industrialized democracies. But we also tell ourselves that we are committed to equality of opportunity, which is that in America, every child will (or should) have a chance to succeed, to make use of their natural talents and traits. The idea is that the smart and hard-working will be able to work their way to the top. In other words, we view competition as central to our social order in which everyone starts at the same starting point, and takes off at the sound of the gun, and then we get very very different times for different participants once the race is won. There are winners and losers, with a wide wide gulf between them. And we need to tell ourselves that everyone “really did” start at the same point and same time, even though it’s not true. MK: In the 1960s, America’s elite educational institutions changed their admissions policies from a bias toward upper-class legacy admissions to embracing public school graduates from diverse backgrounds, selected on merit. The all-male Ivy League schools started admitting women. Wasn’t this move toward higher education meritocracy a good thing? CH: Absolutely. I’m pretty clear in my book (or at least I hope I am) that meritocracy was an improvement in key ways over the cosseted quasi-aristocracy that was the old eastern establishment. The social movements of the 1960s undid that order and more or less vanquished the idea (though not the reality) that only WASP men from certain backgrounds and pedigree should be members of the elite. The meritocracy says that “contingent” features of people – race, creed, ethnicity, gender, city of origin, sexual orientation – shouldn’t have anything to do with people’s elite status. Instead, “merit,” that is talent, brains, drive, should be what determines ones place in the social hierarchy. This definition is an improvement, but is also still pretty deeply elitist and problematic and, in some cases, destructive, for the reasons I lay out in the book. MK: Speaking of education, in your book you charge politicians and educational “reformers” for trying to put the blame on public schools for the inequality of outcomes in the US. How so? CH: If you look through political rhetoric about rising inequality, among both Democrats and Republicans, you see an inordinate, almost obsessive focus on education. The reason is that under the meritocratic framework we’re not supposed to tinker with the “outcomes,” that is: where people place in the race, just making sure everyone’s at the starting line. Hence: No Child Left Behind, Race to the Top, etc. … But we’re asking our education system to bear the entire load, to expiate the rest of the society’s sins and I simply don’t think it’s possible for our schools, even the very best version of them, to live up to that task unless we change a lot of other things about our social order. MK: Toward the end of your book, you state: “Our post-meritocratic inequality is the defining feature of the social contract to which we are all a party.” How does President Obama, in your mind, who benefited from the emergence of meritocracy (advancement based on intellectual capability and skills, not on one’s social background) – particularly in higher education – fit into this current social contract? CH: President Obama is the meritocracy’s crowning achievement. It’s a great testament to the meritocracy that it is only during its reign that a man of his background, race and origin could rise to be President. And he is an extraordinary man. At the same time the tragic irony of the Obama years so far is that he inherited a country that was entering a crisis that the meritocracy produced, one that’s bigger than the office of the president. And yet as a product of that system, it’s (understandably) difficult for him to see it as part of the problem. MK: Who is in what you call the “insurrectionist” class? CH: These are people who feel the crisis of authority – total distrust in our pillar institutions — and see in it the possibility of genuinely reinventing and altering those institutions. They exist on the right and left, those who think the current order is fundamentally a “rigged game.” I consider myself one, though I’ve also got my fears and worries about where this mood of distrust is bringing us. MK: Given that there is such an emphasis in the US on the accumulation of wealth being a defining factor in “success,” why is it surprising that even those who emerged as leaders based on merit would continue to support policies that foster wealth over balancing incomes and assets? CH: It’s not! It’s one of the points I’ve made in the book: that the upper echelons of the meritocracy are increasingly extremely wealthy and money is a neatly quantifiable way of defining “merit.” You end up with a perversely self-reinforcing definition. Rich people are deserving because they are rich. MK: Would you define what you call “vertical social distance” in your book? CH: It’s the distance between people making decisions and the people those decisions affect. For instance, we have historically low levels of veterans serving in Congress and American meritocratic elites are increasingly distant, even estranged, from the US military. I think this has played a huge role in facilitating the longest period of war in the republic’s history. Same goes for the subprime crisis. People on the ground working in “subprime” communities saw the housing bubble happen, saw the explosion of dodgy and predatory mortgages and sounded the alarm, but the Fed and other regulators refused to listen. Not because they’re bad people, but because they were entirely removed from the social world in which the havoc of the subprime industry was most apparent. MK: Is there a different set of rules for the elite meritocracy? Basically, for example, the people who run Wall Street seem to have impunity. CH: One of the most morally indefensible features of American life at this point in history is how relentlessly punitive we are to those on the bottom of the social hierarchy, putting more people in prison than any other industrialized democracy, while being unimaginably forgiving to those at the top – the CEO’s and lords of finance whose malfeasance and in some cases corruption caused the crisis. MK: You quote former White House Press Secretary Robert Gibbs as saying “there are no more arbiters of truth.” What happened to the media? CH: What happens when the media is distrusted and when you have a landscape of institutional authority that has been leveled, is that the social world of consensus knowledge falls apart. When there’s nothing we all trust in common, then there’s nothing we can all “believe” in common and this can lead to some very dark and worrying trends – most notably the decline in the percentage of people who believe in human-caused climate change, or believe that it’s a pressing issue. MK: In the end, you do offer hope of coalition building across unexpected lines, perhaps the Occupy Movement and elements of the Tea Party on certain issues. Am I correct in inferring that you are backing movements as compared to political parties as the source of social change at this time? CH: I think both are necessary, but at this point we really need the politics of the exceptional, we need politics that expand the vocabulary of possible political action, that take place outside of the institutions that are so distrusted. You can obtain a copy of “Twilight of the Elites” directly from Truthout right now by clicking here.